Hello and happy Monday! I hope you've had an enjoyable Easter celebration. Let's kick off the first moodboard in April with something sparkly...after all, diamonds are a girl's best friend, besides being a popular motif on cards, fabric and even as a temporary tattoo! Hallo Ostermontag! Ich hoffe Ihr hattet ein schönes Osterfest. 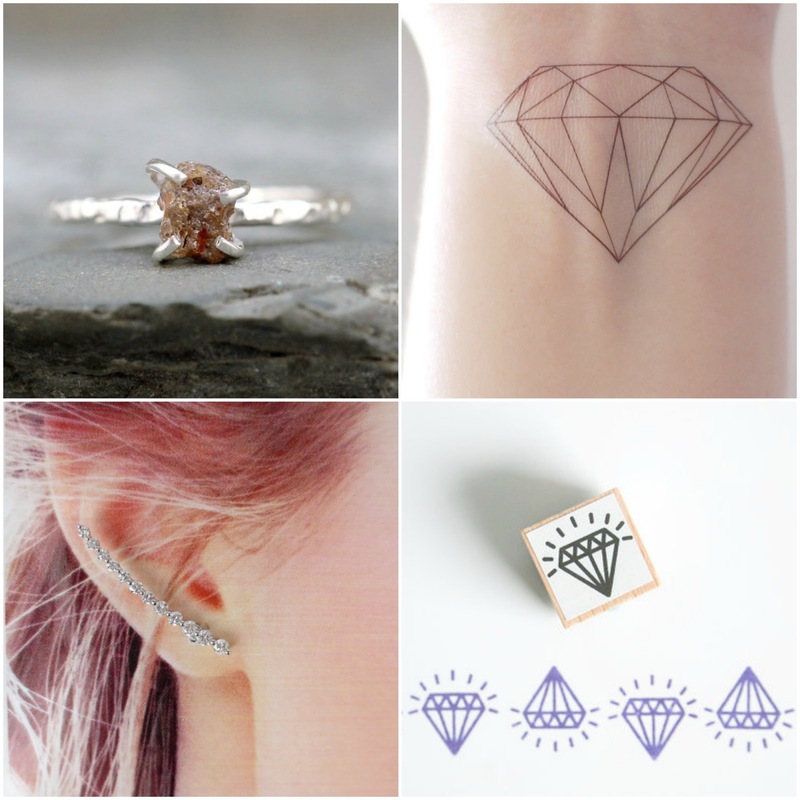 Diamonds are a girl's best friend - den Spruch kennt fast jeder - der Geburtsstein für April ist auch als grafisches Motiv sehr beliebt...so wie hier in meiner Collage als Stempel oder sogar als temporäres Tattoo! great board, and I am so loving that 'in the raw' ring! What an interesting ring. The more I look at it, and the other jewelry in that shop, the more I like it! Please more sparkles for April!!! It is my B-Day month!!!! :) cheers! Wunderschöne Schmuckstücke sind das, liebste Duni! Ich wünsche Dir noch einen schönen Ostermontag-Nachmittag! Love the temp tattoo! I hope you had a great Easter! The stamp is my favorite. =) I love the little rays coming off its diamond! eine sehr schöne Zusammenstellung. Das fein gestochene Tattoo finde ich ausgesprochen schön. My birthstone! I love that shop with the rough diamond jewelry. The pieces are stunning. Raw diamonds are so cool. A friend of mine from high school got engaged recently and her ring is a raw diamond center stone surrounded by "regular" faceted diamonds. It's a stunning combination.